Mosaic Gallery also offers frame accessories such as plate hangers, adhesive hangers, tile hangers and mounting materials for frames. 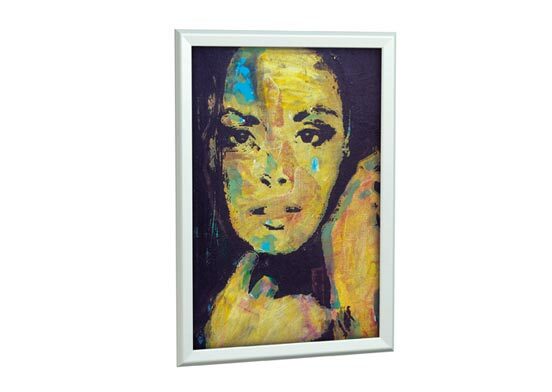 We offer a broad range of accessories and hanging/mounting sets for frames and canvas. Looking for picture frame wire with hooks or panel hangers in various sizes (including spacers) that may be mounted to an acrylic or Dibond plate? You will find them in our frame accessories range. Hanging wires on a spool are available in steel wire (1 mm, 1.2 mm and 1.5 mm), knottable steel wire (0.9 mm, 1.6 mm and 2 mm) and perlon (2 mm). Click frames are ideal for signage purposes, or when you frequently change the object in a frame. The 4 aluminium sides of the frame are easy to click open and back into place again. We offer click frames in sizes ranging from A5 to A0. 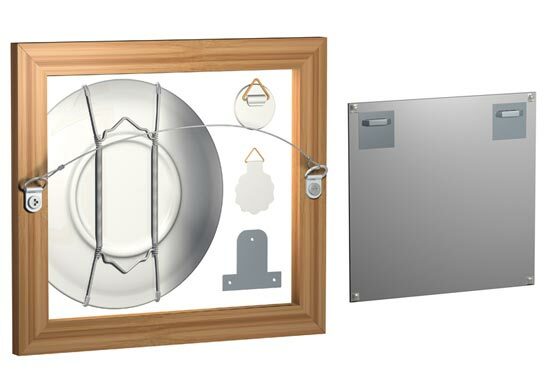 A click frame is easy to hang on the wall by using a flexible hanging system. Using a hanging wire and hook , you simply attach the click frame to a hanging rail. You can then easily move the frame, or adjust the height. The Poster Snap system is a fast and easy way to hang posters on the wall. The poster is simply clamped between two aluminium strips at the top and bottom, also referred to as ‘poster clicking’. The Poster Snap system may be used for posters with widths of 50 cm, 70 cm, 100 cm and 120 cm. To hang the poster system, you can use a flexible hanging system consisting of a hanging rail with cords and hooks. There are other ways to hang a Poster Snap; view our Solo hanging systems.